The organizational history of American government during the past 100 years has been written principally in terms of the creation of larger and larger public organizations. Beginning with the Progressive movement, no matter the goal, the reflexive response has been to consolidate and centralize into formal hierarchies. That efficiency, effectiveness, and accountability, and the coordination necessary to achieve them, are promoted by such reorganizations has become widely accepted. Borrowing from social psychology, sociology, political science, and public administration, and using the public transit system of the San Francisco Bay area for illustrative purposes, Donald Chisholm directly challenges this received wisdom. He argues that, contrary to contemporary canons of public administration, we should actively resist the temptation to consolidate and centralize our public organizations. 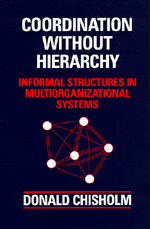 Rather, we should carefully match organizational design with observed types and levels of interdependence, since organizational systems that on the surface appear to be tightly linked webs of interdependence on closer examination often prove decomposable into relatively simpler subsystems that may be coordinated through decentralized, informal organizational arrangements. Chisholm finds that informal channels between actors at different organizations prove remarkably effective and durable as instruments of coordination. Developed and maintained as needed rather than according to a single preconceived design, informal channels, along with informal conventions and contracts, tend to match interorganization interdependence closely and to facilitate coordination. Relying on such measures reduces the cognitive demands and obviates the necessity for broadscale political agreement typical of coordination by centralized, formal organizations. They also advance other important values that are frequently absent in formally consolidated organizations, such as reliability, flexibility, and the representation of varied interests. Coordination Without Hierarchy is an incisive, penetrating work whose conclusions apply to a wide range of public organizations at all levels of government. It will be of interest to a broad array of social scientists and policymakers. In an earlier version, Coordination Without Hierarchy received the American Political Science Association 1985 Leonard D. White Award for the best doctoral dissertation in the field of public administration, including broadly related problems of policy formation and administrative theory. Donald Chisholm is Assistant Professor of Political Science at the University of California, Los Angeles.